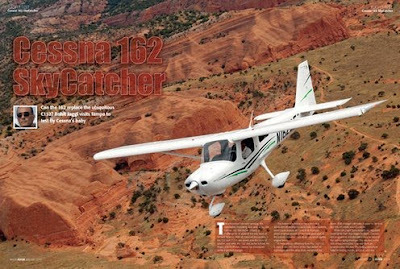 So from everything you've read, what do you know about the Skycatcher. Until recently, I knew that they'd taken orders for over 1,000, that deliveries had started, and that they were being built in China. 2. There are four more due to be delivered in May, and another four on the way. 3. Two more are being loaded this week (I assume this means into shipping containers in China). 4. Shenyang, Cessna's Chinese partner, has announced plans to build a dedicated Skycatcher factory, this should be up and running next year. I must admit, I'd kind of assumed that, like Diamond, Cessna had already built a factory in a joint venture in China. I'd also assumed that the factory in China would be churning out Skycatchers at a far higher rate, notwithstanding the modifications being made following the testing spins. It looks like it will be a while before Cessna delivers any to the UK, which will at least give EASA an opportunity to sort out the CS-LSA regulations.